I don’t have much to say about this recipe except that it’s wonderful. I discovered sweet potato souffle last year when my friend Mindy made it for our Thanksgiving dinner. She got the recipe from her sister who got from a friend who got it from a friend and, well, you get the idea. It’s one of those recipes. Note – I have adapted this recipe a bit from what I posted last year, after making it twice myself. Go with this version. Mix the "Base" ingredients together in a medium-large bowl. Spread in a 9x13 pyrex dish. 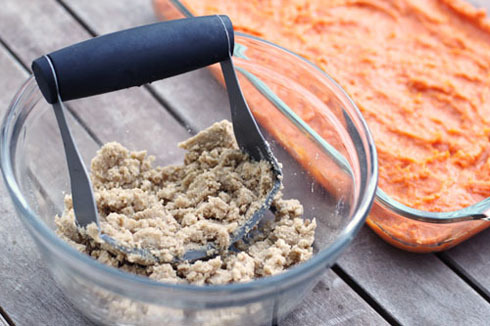 Mix together the brown sugar, flour and butter with a pastry blender or fork until crumbly. 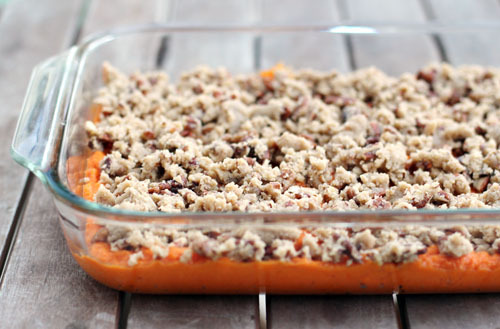 Mix in the chopped pecans, then spread topping evenly over the sweet potatoes. I like to use the pastry blender even after adding the pecans to crunch them up a bit more. 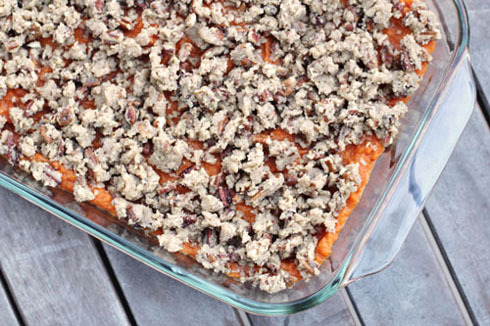 I made a version of this Sweet potato dish this week, it was fantastic! Thank you for this recipe, I’ll be trying it! I’m feeling a teeny bit famous. And hungry. Yum! This sounds fabulous. Definitely need to add it to my recipe box as well! I like it! The simplicity of it is even more appealing to me. We’re definitely going to try this. This dish looks absolutely delicious and I agree that the simplicity of it is equally appealing. Thanks so much for sharing this recipe! Yummy. What a lovely idea. I’m going to try this instead of my regular honey roasted sweet potatoes. Or is that too long with the eggs in it? Toast some small marshmellows and nuts on top also and you will have the bomb. My 4 year old grandson loves that as all kids do. We live on a farm and a small lake in Lancaster, SC. Happy Thanksgiving to all fantastic cooks. So do you use actual sweet potatoes, or yams? And if it is yams, (which I’m guessing it is due to the orange color), roughly how much am I using? At my grocery store today they had yams and then JUMBO yams. I’m using the orange ones…it’s interesting, I remember watching a Good Eats episode once and he basically said the word yam was a marketing thing decades back, and that they’re essentially the same thing – with different varieties (white, orange, etc) – I want to get down to the bottom of that one day! ANYWAY… 🙂 I used 3 regular sized yams (orange sweet potatoes, whatever). the original recipe called for 3 cups, but I simplified it because whenever I’ve just used three regular yams it works fine, so it might be more or less than 3 cups, and it’s still mighty tasty. 🙂 you could probably even do more if you wanted to go with jumbo – as you can see from the top picture, there is still space height-wise in the dish. if you do more, maybe just add a bit more of the other ingredients to balance it out. I’m rambling – sorry! 🙂 hopefully this is at all helpful! In the south the long orange ones are considered to be yams, and are also used in very sweet recipes with lots of sugar and brown sugar just fried up in a pan until the sugar is carmelized. Regular sweet potatoes are also very sweet and may not be as dark orange and may resemble more a regular potato. They can be different varieties that resemble each other. We usually plant the regular sweet potato variety on our farm and it works very well in all recipes, souffles, casseroles and making what we call candied yams in which you use huge amounts of sugar. It can take a very long time to make candied yams. You want the carmelized sugar to drip heavily off your kitchen utensil.This of course is just an opinion of an old country gal raised in the south. We love our mountains and our beaches in North and South Carolina. Please come and visit us sometime. Happy Thanksgiving to All! Happy cooking too! Thanks Jane, for this tip and so many others! do you freeze it before or after baking? I did freeze it before baking and took it to a destination Thanksgiving in Las Vegas. Delicious!!!! When I mentioned the recipe to my parents, my Dad asked for me to make a recipe from a friend of my parents. I looked at that recipe and yours, very similar, but I used yours and my Dad liked it even better than the one requested! These sweet potatoes are awesome! My family loved them and asked me to make these for next Thanksgiving and my sister wanted the recipe for an upcoming get-together. Thanks Jane! We’ve been making this in my family for YEARS! I actually have a new post written and sitting in my drafts folder talking about this recipe!! I don’t know about you, but we never have leftovers with this, and I normally make at least a double batch! now THAT sounds like quite a wonderful modification!!! I’m so glad I found this recipe. I got it from a friend about 12 years ago, and have been making it every year. Recently we moved, and I cannot find the recipe anywhere, so I thought I would try the internet. so many versions, but yours is the closest to the one I make. Thank you so much!! 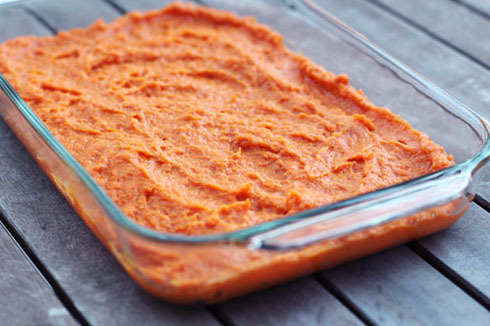 yes, you could definitely add more sweet potatoes – there’s plenty of room in the pan still when you only do 3 sweet potatoes. I would cook them for 30 minutes and then check to see how hot they are in the middle – you want it super hot so you know it’s cooked through, since there’s egg. I would imagine you’ll probably go 10 minutes over or so, but definitely check it along the way! good luck! This is the recipe matts family makes and it is THE best. Definitely a must for any thanksgiving.